A long title, and it’s taken me a few weeks to sit down and type it. In my own review of assignment 3 (12-October-2015) I described the exercises as absorbing, fascinating, and I was proud of my work. I wrote of my new and fragile sense of accomplishment. The feedback from my tutor was very positive, with comments on exciting ideas, curiosity and energy in approach, and “a good mixture of successes and failures”. In her report Rebecca identified strengths exhibited, with specific examples and an explanation of why they are important. This was a wonderful confirmation of my own sense of achievement, and it makes the general course expectations clearer and more personal – I know the behaviours to pursue, repeat, strengthen. Taking a technique and exploring it further. My writing is articulate and analytical, my research is varied, my blog is organised, my photos good. it arrived just as I was coming to a thudding crash in printmaking (not really sure “thudding crash” makes sense, but it certainly captures the feeling). I’ve found only minor purpose from previous materials, a little printing on cardboard or texturing with a previous sample. So far I haven’t found a way to draw or extend what I have printed. In the last assignment I was exploring a three dimensional sample in two dimensional media, which is a very open process. Everything currently is so flat. Prints are so familiar I’ve found it difficult to let go of expectations. I haven’t been able to treat a failure as a discovery of new possibilities. I’m experiencing printmaking as something very technical, and finding it difficult to attend to compositional and aesthetic concerns. Stuck in the fundamentals I don’t feel close to finding new territory. Previously I had some great, new materials. Now I’m using very nice mainstream printing inks. Nothing seems quirky, fresh or experimental. It’s all so flat – physically and emotionally. Getting a great report for previous work just seemed to highlight how off-track I’ve got. I’m continuing to challenge my mindset. Right at the beginning of the assignment I noted the different focus of this course to a printmaking course (18-October-2015). Even when I don’t like a print as a whole I’ve tried to find a detail or something positive about each one. In some work yet to be posted I’ve tried to follow up or develop ideas. Also yet to be posted is more research, very focused on little details from other artists which I might be able to adapt to my use. Perhaps the most important challenge-to-mindset relates to my tutor’s remarks on the vulnerability of the artist. “It was very interesting to read your understanding of how vulnerable the artist is. Even though this is scary it is also very positive. It means you are at the point where interesting and exciting art/design can be made. It is evidence that you are taking risks and perhaps challenging preconceived ideas. The balance of not being too precious yet taking your work seriously is important. In my experience many artists, even very successful ones feel vulnerable when their work is first out in the world. Some avoid preview exhibitions nights in case the work is viewed negatively.” (Rebecca Fairley). How much more vulnerable we are to our own inner critic? My old harridan seemed transformed. I could look at an apparent failure and find it glorious, or if not glorious then shrug and move on to pursuing all the other possibilities being generated. Now I’m not finding exciting possibilities. I’m not being open, letting go of expectations. It’s harder to nurture that vulnerability. I need to let go, find fresh eyes, lighten up. A favourite story – in maths at school the teacher would introduce some new, bizarre topic and say lots of things that didn’t mean anything and didn’t hang together. Others in the class would interrupt with lots of questions, trying to make sense of all that new information. I’d sit back and accept everything as a given. I suspended disbelief. Later when we’d had the complete presentation, worked examples, etc, it would make sense (or not, in which case just following the instructions usually worked). It was effective, and overall I got further than the ones who needed results straight away. I need to suspend disbelief. I need to see what is happening in front of me, challenge those preconceived ideas and the inner critic. Maybe I’ll find the potential, find new paths, new risks to take. Worst case I do an adequate job, just following instructions. Turning up and doing the work is a good thing, and maybe if I give myself a chance it will lead to better things. The rhythm of work has changed during this assignment. Rather than the rush and buzz of one sample leading to new questions and new samples in quick succession, both molding and casting took time to set up a sample, and casting in particular required time before the results could be seen. There were more technical constraints in the materials – change proportions too far or misjudge temperatures and the sample might crumble or refuse to set. I responded in two main ways. Having identified huge potential in early trials of my initial materials I chose to concentrate on exploring them in more depth. Other materials such as silicone and papier mâché remained in the cupboard, to be explored another day. My second response was to slow down even further, to spend time thinking about results with sketchbook work, deciding which ideas to take forward, trying to make each sample respond to different questions. My results include some strong samples and of course some failures. Of great interest to me is the potential for combinations of materials, either in the actual making or in display groupings. My four chosen materials provided a wide range of properties and potential, as well as combining in exciting ways. I had already experimented with polymorph, a thermoplastic, in a sidetrack during assignment 1 (21-April-2015) and it has appeared in a number of samples since. In this assignment I was able to push it further, finding new ways to melt and form it as a molding material, and to embellish it with heat tools and stitch. ComposiMold, a pliable, reusable material fairly new to the market, is rich with potential. I poured and brushed it, stitched into it and embellished with heat tools and a 3D plastic pen. I identified a number of possible constraints – heat, humidity, longer term stability. Lacing through holes was the most successful join with polymorph, but the “failures” were interesting in their own right. 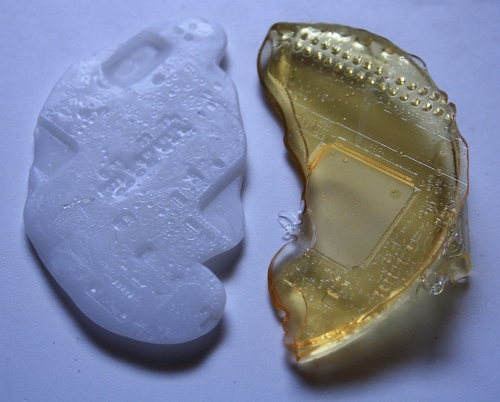 The two materials, one more glossy and clear, the other opaque, both responding to heat, work well at a similar scale and are an effective combination as seen in sample p3-12 (1-September-2015). Plaster and an eco resin (intended for laminating rather than casting) proved another exciting combination. Once again there are contrasts in transparency and reflective properties. Sample p3-51 (26-September-2015) is in my view the single most successful response to the brief of exploring the interior space of a vessel. 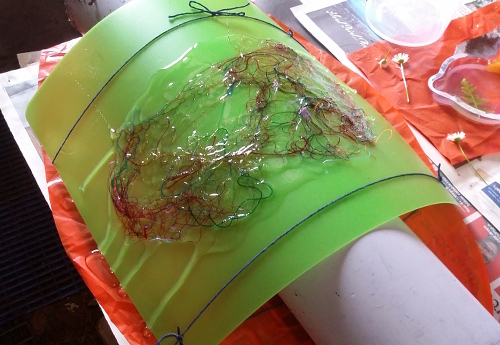 A failure of casting using plastic ziplock bags (samples p3-33 and p3-35) led to the observation of dribbles of resin, and in turn to one of the most dramatic samples, organza embedded in resin (p3-46, 23-September-2015). 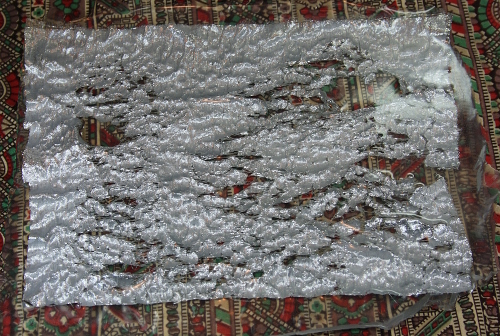 The textile itself had previously appeared in a number of samples – distorted with a heat gun in sample p1-75 (21-April-2015) and joined in sample p2-28 (17-June-2015). I think the current sample is one of the most powerful produced in this assignment, presenting textile in an exciting and novel way. I continue to use this blog to communicate all aspects of my work on this course, including research, making, recording, sketching, sorting and reflecting. All samples and sketchbook work are photographed and presented. Taking my use of technology further I set up a new pinterest board https://www.pinterest.com/fibresofbeing/mixed-media-for-textiles-assignment-3/. This does not include any commentary but gives a quick visual overview of all samples and easy access to the original blog posts with more information. I found this very useful, particularly while Sorting but also as a quick way to refer back to previous work, so created boards for assignments 1 (here) and 2 (here). In feedback my tutor has recommended that I continue to develop the language I use to discuss my work. In assignment 2 I experimented with a number of different “voices”, which felt stilted and also overly formal, not modern. In this assignment I have tried to develop in a more natural way, just slightly more objective and more open. I have attempted to be more consciously aware of the language used by artists during my research and general viewing and to adopt scraps of phrasing that seemed appropriate to my own work. If I have been successful specific instances should be virtually undetectable other than as part of a general slight improvement. As for the actual samples I believe I been able to address the course requirements with some interesting and exciting results. I enjoy the exploratory sampling approach encouraged by this course. 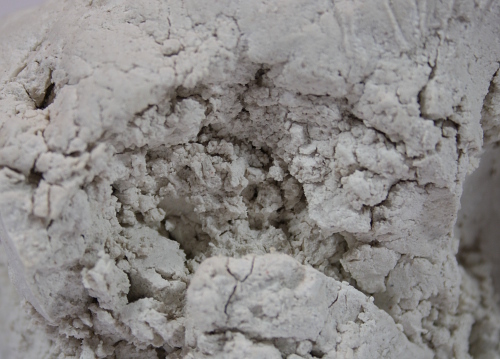 The attractive little bowl of sample p3-11 (26-August-2015) grew from an observation of ComposiMold in sample p3-8. In turn it led to p3-25 (6-September-2015) – itself a rather disappointing result, intended to capture the space of a mug as a variant to the successful p2-70. I certainly have the sense of developing an approach, a process, that will support ongoing creative exploration and expression. It is incredibly satisfying to bring forward ideas from previous experience. 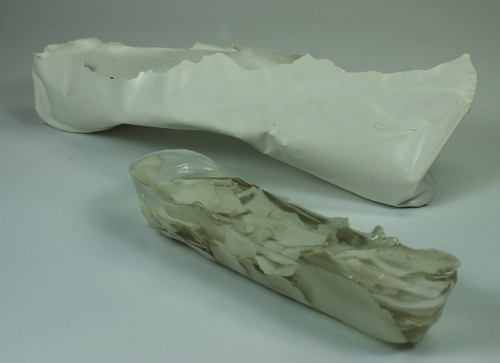 There have been failures – sample p3-52 (26-September-2015) was a truly awful attempt to use the crumpled paper of assignment 1 as a source of embedding in plaster (lesson – respect the short pot-life of plaster). In the same work session sample p3-51 was an exciting success, bringing forward the wrapping and tying of assignment 2. This was the last major cast of the assignment and I threw ideas at it. From my notes at the time: “I had no idea if this combination could work, which seemed a good reason to try.” I am very pleased by the outcome of the risk taken, but I am also confident that I would have been pleased with a failure which answered some of my questions and suggested new ones. In sample p3-53 (1-October-2015) I look risk one step further by exploring breakage of a cast. This has echoes of past samples (the broken mug of p2-72, 22-July-2015), and also with my research. I was surprised by the strength of the cast – it was repeatedly thrown, not dropped, on a concrete floor. As in the last assignment I created a pinterest board of artwork using molding and casting (link). I was also given permission by a number of artists to use their images in my posts. Sample p3-47 (26-September-2015) was very heavily influenced by the work of Rebecca Fairley, my tutor, to the extent that although I love my result I feel it is too derivative to pursue. On reflection now, perhaps breaking and reassembling a series of such samples would make them more my own. Using the resin to embed the fragments or as a kind of mortar could be interesting. Another clear influence was Giulio Paolini in the breaking of sample p3-53. Other than this my focus was on exploring properties of my particular materials. Any other influences were more my own previous samples, for example the reappearance of corrugated cardboard in samples p3-77 and p3-78, and large bubblewrap in p3-23 (all 6-September-2015). I would like to make special mention in this review of my sketching. I used sketching as a way of stepping back from sampling to review and plan (for example 29-August-2015) and in research responding to tutor feedback (4-September-2015). Inspired by other OCA students I extended my range of media and drawing surfaces (14-September-2015). I also spent a day with a fellow student with the specific aim of working more freely and on a much larger scale than I have ever used before (28-September-2015). I am pleased with my ongoing progress in this area. I was thrilled to get a very positive response from my tutor for my last assignment (my reflection on that 29-August-2015). I have tried to continue and build on that result, but as mentioned at the beginning of this review I have been conscious of a different rhythm in my work in this assignment. I have found molding and casting absorbing, fascinating. I have found materials and methods that I think will be important in my work in the future. There has been a shift in my thinking. I am proud of my work. It pleases me. I spent a huge amount of time Sorting because I enjoyed handling the samples, rearranging them, thinking about the possibilities they contain. I am looking forward to my tutor’s experienced, objective feedback and to her guidance, but for the first time – and this is very new and fragile – I have a sense of accomplishment independent of this. A number of the samples in this Part have interesting and / or attractive elements, and even more have future potential. However I think the greatest potential is in the materials themselves, and in combinations of the materials. 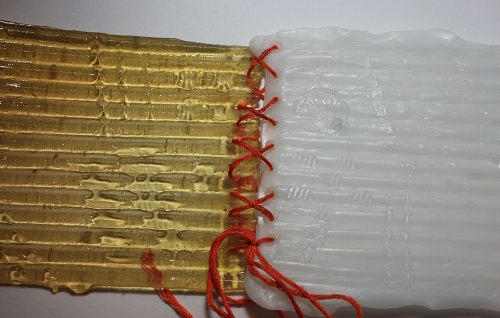 Intrigued by their properties, I narrowed my field of enquiry to Polymorph and ComposiMold for molding, and to plaster and epoxy resin for casting. In the Sorting phase I have considered individual samples, but I have also re-photographed a number in small groupings of mixed materials. 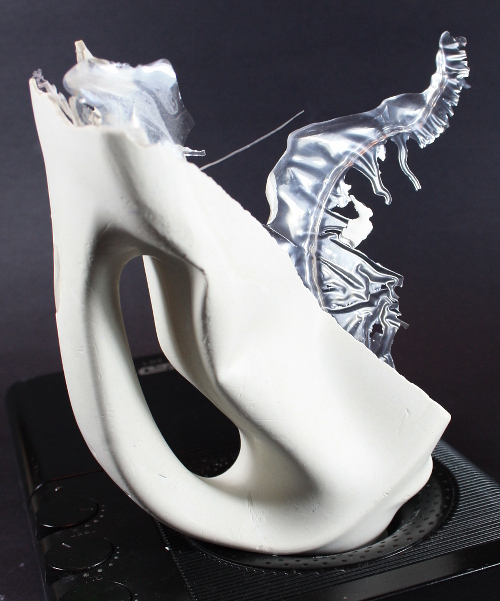 Both the polymorph (a thermoplastic) and ComposiMold (a reusable, pliable molding material) took fine, detailed impressions from a variety of sources – fruit, computer components and textiles. 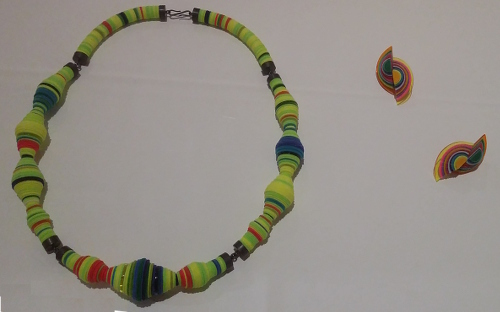 Displayed together their different colours and properties complement each other. 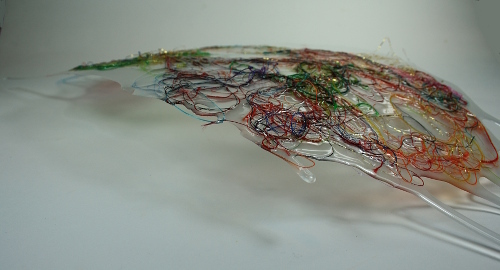 One of the samples was embellished with a plastic line using the 3D pen, a useful way of bringing extra colour and texture into the presentation, although it should be noted that I have also been successful in experiments colouring both base materials. See posts 23-August-2015, 26-August-2015 and 1-September-2015 for details on the samples above. 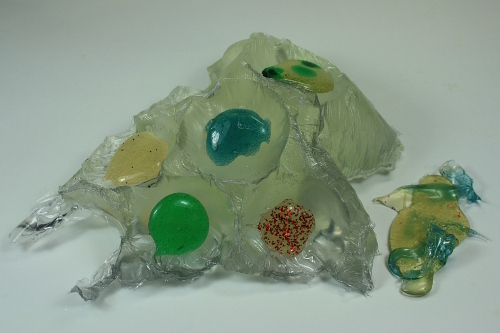 A series of samples which built on earlier exercises in scratching (assignment 1) and joining (assignment 2) identified more potential in the materials. Careful use of heat allowed interesting mark-making which I then further embellished with stitch. The materials were easy to work with and responded well to these manipulations. I would like to take all these ideas further. My first foray into casting led to a fortuitous disaster (14-September-2015). The plastic bags whose interiors I was exploring broke, spilling much of the resin. The complex shapes of the remains in the bag look like fantastical creatures. I also enjoy the idea of capturing a brief moment in time. Thin dribbles extending down from the tears were surprisingly strong, an observation whose potential I started exploring in later samples. An exciting result was sample p3-46, which also picked up on a happenstance “foot” of resin which formed on a stirring stick (23-September-2015). 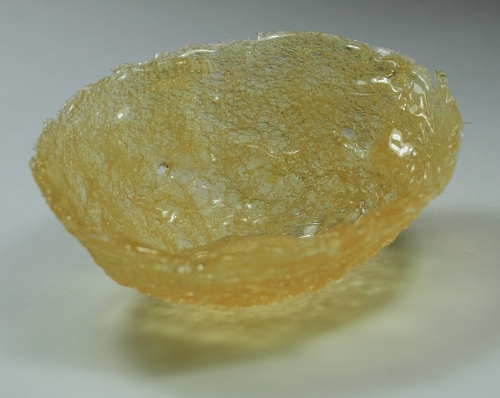 Synthetic organza, previously heat-treated in assignment 1, was embedded in a thin coating of resin. I find this a very exciting sample. The texture of the treated fabric has been captured without the flattening effect that is sometimes seen in a thicker casting. The nature of the fabric is the main player in the piece. With the round foot it’s a little formal, with a similarity to an award or trophy, but there’s no real restriction on the shape or size of the base, or even any necessity to have a base at all. I’d like to make an armour of overlapping plates, playing with light and colour. In the photographs above I have paired it with a plaster sample. There is an affinity of line, creating an intriguing space between the samples. Both were formed using fabrics and there is a link in the captured imprint of the plain weave. The plaster appears soft, absorbing light – there is a very fine haze of fibres on the surface. In contrast the resin is bright, hard, colourful. A pleasing combination. 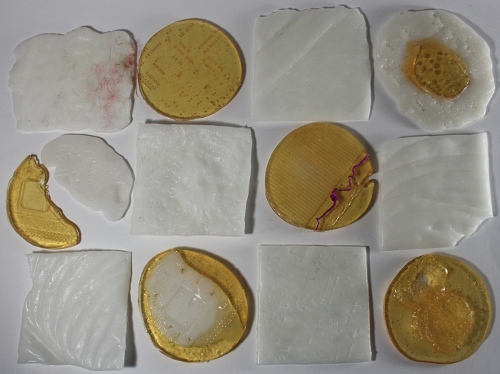 Direct combinations of resin and plaster are seen in samples p3-51 (26-September-2015) and p3-39 (23-September-2015). The interior space filled in p3-51 was the most complex of castings done and I find it a particularly interesting form. Further interest and complexity is provided by the shards of resin that were embedded in the cast, providing notes of drama, bringing sparkling light. 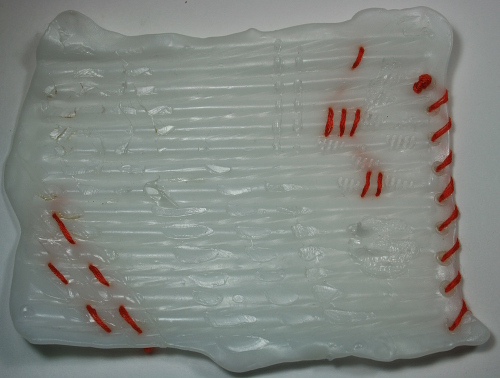 Sample p3-39 is quieter, chips of plaster embedded in a simple resin form, but the strength and gloss gained by protruding chips suggest potential for treatment of other plaster casts. Time restrictions did not allow exploration of this, but it would be interesting to drizzle resin in a partial coating of a plaster cast. Also included in the photograph above is sample p3-23, made of ComposiMold brushed onto large scale bubble wrap. The light, texture and colour of this sample add extra dimensions to the grouping and the placement breaks down the severe lines of the base used to display the casts. Another mold created using the same brushing method was less successful. 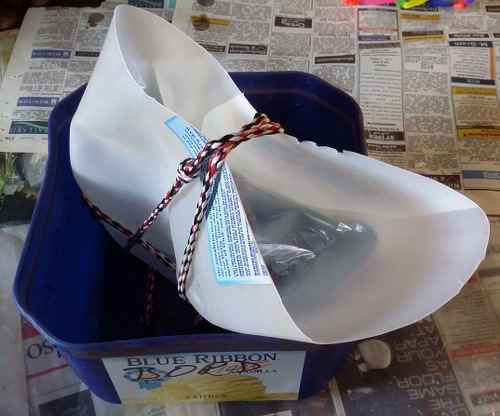 Sample p3-25 (6-September-2015) was an attempt to follow up the success in assignment 2 of wrapping a mug in plastic (sample p2-70, 22-July-2015). There are a number of variables to manage in this technique, including heat, layering and thickness of the material. There is definitely potential here. The grouping of samples p3-41 and p3-47 arose from a similarity in the shape of the hump of resin and the curves of cable knit in the plaster. The strong lines in the plaster are more quietly echoed in the lines of the resin, created by the hammock of fruit mesh bag which formed the cast. The dramatic lighting of the larger photograph emphasizes the different materials and their lines. It also shows the cloudy centre of the resin. An on-line shopping mixup meant I used resin intended for laminating rather than casting. This was of great benefit in sample p3-46, where the fast cure (25 minutes pot life, 4 hour tack free time) was much more suitable than the slow cure resin intended for casting (for thick casts 360 minutes pot life, 72 hour tack free time). For thicker pieces such as the sample shown here the fast cure led to improper curing and cloudiness. At some point I will probably want supplies of both types of resin. None of the samples in the photograph above would have been selected as a standalone during Sorting. The blue is dregs of resin caught in a bucket when my plastic vessel failed (14-September-2015). The indigo suggests possibilities for playing with colour in resin, not otherwise explored in this round of samples. The upright sail-like ComposiMold started as an intended glaze, which failed when it didn’t adhere to the chosen surface (6-September-2015). The delicate textures show well when one can look through the sample. New information in this combination is my success in drilling holes in both resin and plaster. Here the hole was large enough to allow a linking of resin and Composimold, and any number of other joining methods come into play once holes are available. Finally p3-35 (14-September-2015) – not a failure, but overshadowed by other samples in plaster – works well in the trio to build up a little story. Sample p3-53 (1-October-2015) was a fascinating process which I would like to have presented as a video or stop-motion. There is a reference to Giulio Paolini and also to the broken mug contained in sample p2-71 in assignment 2 (22-July-2015). I repeat my comments from then: “… there are ideas of loss and change, with an extra edge of violence or trauma.” Given how many impacts the new sample was able to absorb, resilience rather than loss could be the theme. It would be interesting to hide and reveal a series of items in plaster. From the beginning of this project I have been looking forward to this development technique and wondering if I could carry it through. My inspiration is L’altra figura by Giulio Paolini which I have seen and enjoyed very much at the Art Gallery of New South Wales (www.artgallery.nsw.gov.au/collection/works/349.1987.a-c/). It always gets a reaction from new viewers when on display in the Entrance Court. Two plaster casts of a Roman copy of an earlier Hellenistic bust look down from their plinths at the shattered remnants of a third bust. I selected sample p3-50 for the experiment. It is one of the larger samples and the embedded rope could result in interesting interactions. Deciding not to be tentative, to go for a strong result, I threw the sample with some force from above my head down onto the concrete floor. The sample was strong enough to survive a series of such throws, as seen below. There is a sense of discovery, perhaps titillation, in peeping at what was hidden, at what is revealed. As hoped the rope acted as reinforcement. It also created weak points and stresses in the breaking plaster, strongly influencing the results of the successive impacts. The fibres of the sisal hold on to broken fragments of plaster, keeping them part of the whole even as they break away. The original sample showed an interesting combination of materials but was unexciting overall. The developed sample shows the materials interacting in a very direct and dynamic way. It is physically much larger, the central piece itself and even more the fragments spread around. It is also more three dimensional, with pieces sitting askew and raising the sample from the surface. Some of the individual fragments show molding of the rope, a rather nice link back to the first project of this assignment. More generally the grainy surface of the broken areas of plaster contrasts pleasingly with the original smooth surface. A further development would be to add video of the moments of impact and breaking of the plaster. This thought came after the action, and I suspect would need special high-speed filming to be effective. Increasing, improving and extending my sketchbook work has been one of my focus points for this assignment. This had a big boost on the weekend when my friend and fellow OCA student Claire came over for a day of mark making. You can see Claire’s work and read her account of the day at https://tactualtextiles.wordpress.com/2015/09/28/mark-making-with-paints-and-tools/. The plan was to go big and go wild. We both started with some paper Claire had found at http://reversegarbage.org.au/. The printing on one side and coated (waterproofed?) reverse suggested it was roll ends from jiffy bags or similar. We worked on the blank but coated side which gave some interesting interactions especially when I attempted a watercolour wash which turned into a watercolour speckle. More often than not I work on A3 paper. 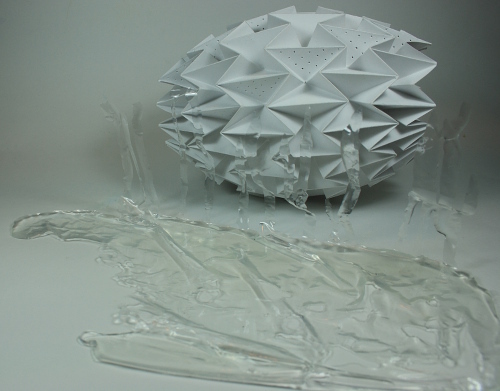 This piece is 102 x 76cm – more than 6 times the surface area. It felt so freeing, making big sweeps with the shoulder. It’s mostly acrylic paint, but also water colour and printing inks. I remember palette knife sweeps, fruit net bag rolling and stamping, scraping with a serrated knife, dabbing with paper towel, pouring watercolour, a jittery-bump movement like going over corrugated dirt road… It was an exciting ride. Next up was 100 gsm cartridge paper. White cartridge paper is my go-to base, but not at this size – 84 x 72 cm. Claire and I were swapping paints, tools and ideas, and it was amazing to see our work side by side and how different the results were. I have a definite tendency to chaos and mess! This has acrylic paint and screen printing inks plus some red oxide (from the hardware store for colouring concrete, but didn’t make it into a plaster sample). There was printing from a bracken leaf (conveniently grows at the garage door), various sizes of bubble wrap, paper towel, cork, sewing reel, peg bag side, drainer “thing”, jar tops – anything circular within reach. Also some lovely circular swirls using Claire’s new patent-pending technique involving a pipecleaner and considerable dexterity. The final piece for the day arose from frugal determination to waste not a smear of paint. My favourite corrugated cardboard, tiny at 48 x 27 cm. Obviously none of the above are resolved works. They are the physical leavings of a fun and freeing process. I think there’s also a huge amount of detail that could be explored with L-shape frame finders. Lots of texture, lots of movement, lots of ideas, lots of space. The next day I continued, this time responding to some casting samples. First sample p3-51, plaster and resin in a juice jug. 83 x 64 cm white cartridge paper. Water-resistant crayon and watercolour wash. Cramming (too?) many ideas into one sketch this is a blind, continuous line drawing, overlaid in two or three layers. I then tried to make sense of all the lines with a “clarifying” wash of black watercolour. Lots of energy in the lines and I felt I had good focus and observation of the sample. The result isn’t informative as a picture but I’m pleased with the sense of pushing myself. The drawing part is 66 x 64 cm white cartridge paper, not filling the page particularly well, once again based on sample p3-51. This uses charcoal for the plaster areas and grey oil pastel for the resin. There’s something very odd going on with the proportions, especially in the centre. My main focus was the lines and planes formed by the jug, and I think the curves of the handle went well. The big spike of resin contrasts effectively with the smooth mass of plaster. Once again I was happy with my maintenance of concentration and keeping my eyes at least as much on the sample as the page. I think this shows good progress for me, although I actually prefer the first version – so much more lively and expressive. Next some work with sample p3-47, the cast of ribbed knitting. I actually started this a couple of days earlier, using the 3D pen and “drawing” in plastic filament. The photograph above shows both sides of the drawing, which is roughly 13 x 5 cm. Lots of energy, and it was good to work in a palette of mainly neutrals which is a change for me. This is based on just one small section of the repeated pattern. 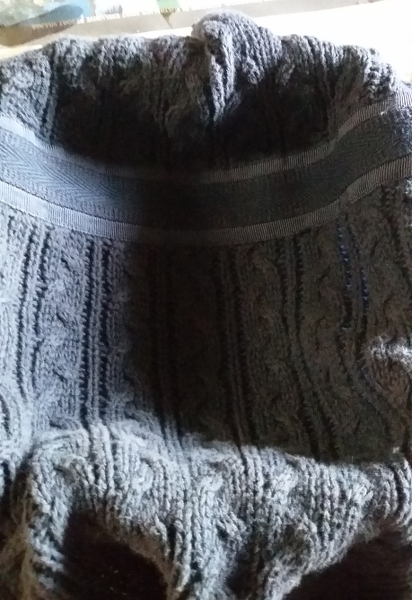 Given the knit is so regular I wanted to understand the structure more. The base is 54 x 33 cm, brown paper that I crumpled and painted with gesso a few weeks back. I started lower right using conte crayons. The not particularly complicated pattern was eluding me and the drawing was clumsy, so I stopped and concentrated on a simple graphic map. Seen on the left, this is a different kind of clumsy but at least the pattern repeat emerges. Top right I changed to two pastel pencils held together to make a very loose and simplified interpretation of some of the patterning. This is the most successful section of this page. Moving forward in time, I returned to sample p3-47, this time using tissue paper as the base. 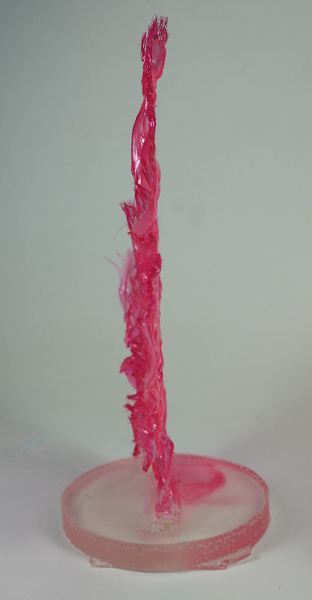 A direct rubbing of the sample using a large wax crayon. Little pattern emerges. Another direct rubbing, using oil pastel. Some of the pattern can be identified, especially the original woven band area, but the knit section is still indistinct. It’s amazing that something so clear on the cast is so lost when only the top layer of the surface is recorded. I decided to move to ink on the tissue. Above is a messy trial of tools – corrugated cardboard, the end of a clothes peg, the side of some styrofoam packaging and a bamboo pen. A more considered stylised version. I like the curves of cardboard very much. The herringbone columns were drawn with the bamboo pen and have a pleasing variability. The simple uprights used the corner of the styrofoam, giving the broken effect I was looking for. I think there are some useful ideas in this. Liking the marks, I tried combining them in different ways. All three of the marks are included here. The combination is balanced, but there is movement across the sheet with the waves of corrugated cardboard. A less interesting version using cardboard and styrofoam. My original intention using tissue paper was to layer pieces up in interesting combinations. Unfortunately none of the combinations interested me. Wanting to take them forward somehow, I finished by experimenting with the photo of sketch_20150927g, using a series of distortion filters in gimp. Some of the above look quite textile-y in nature, and it was good to explore some corners of the software. Coming towards the end of Casting I felt I’d done some interesting exploration in new-to-me materials and some of the samples showed promise for future development. However I hadn’t followed up any of the ideas or inspiration from my research at the beginning of the assignment. 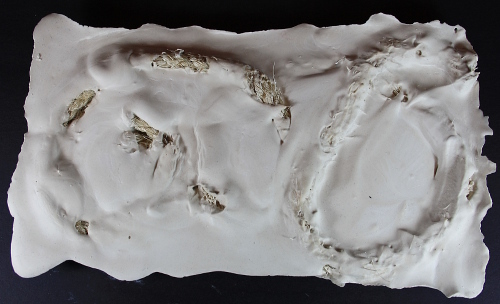 I wanted to work at a slightly larger scale, and I also wanted to go a little further with the sense of substance and formality that I found in my initial plaster samples (p3-35 and p3-36, 14-September-2015). The first sample attempted was inspired by the work of Rebecca Fairley (my tutor, my research posted 16-August-2015), in particular the texture and wisps of fibre that attracted me so much. Sample p3-47 detail – wisps? 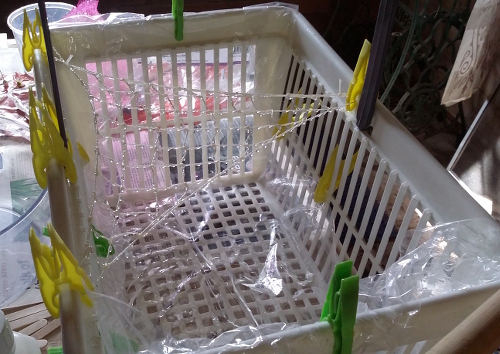 Some machine-knit fabric from a cardigan (op-shop find) was used to line a plastic tub. Plaster was poured directly onto the knit. There was almost no penetration of the plaster through the knit. It was easy to pull the fabric away with only minor damage to the plaster surface. 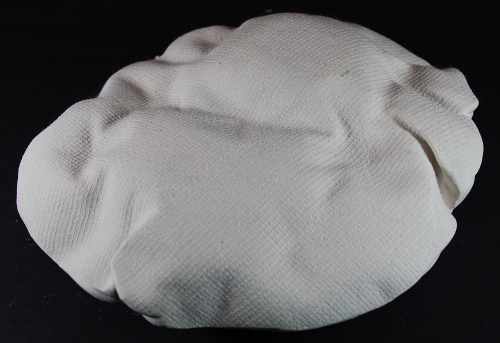 The resulting cast is around 14.5 cm square and 2.5 cm high. The photograph above was taken in raking light to emphasise the texture created. The cardigan had a high waist formed with heavy woven ribbon, which created the band seen in the cast. This sample is very attractive. There is a variety of texture contained in a not quite rigid framework of lines. At a distance there is a strong overall structure, with a lot of interest and detail revealed with closer examination. There is an overall blueish colouring to the plaster due to capture of fibres from the dark navy knit, but you have to look very carefully indeed to see the individual fibres. This sample suggests a lot of potential, my only concern being that it is too directly derivative of the source inspiration. I wanted to follow with a sample more personal to me, so I chose a woven cloth (commercial furnishing fabric – I couldn’t bring myself to use handwoven on an early sample). This sample also brought in the idea from the course notes of influencing the shape of the cast by placing the vessel on a found object. 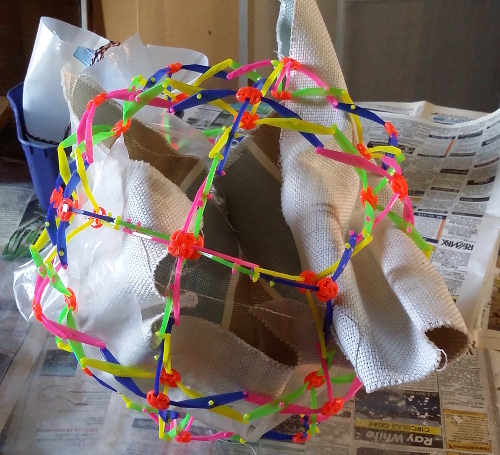 The found object is a child’s toy, a plastic grid that expands into a sphere. I lined this with heavy plastic and then the woven fabric. I adjusted the manufacturer’s recommended water to plaster ratio, reducing the amount of water. I thought a less liquid mix would reduce leakage through the fabric. When setting up the sample I hadn’t considered the issue of getting the solid plaster out of the sphere, but it was easy to disconnect some of the plastic struts. The fabric came away from the plaster easily. Possibly it had some kind of finish applied during manufacture. Certainly there was no apparent penetration of the material. There is a delicate overall texture to the finished sample reflecting the plain weave fabric. This results in a very soft response to lighting, quite matte. Combined with the soft undulations from the open sphere vessel the cast looks just like a draped piece of cloth – in fact my partner mistook it for cloth when he first saw it. There is something so gentle and understated about this sample. It has greater mass than the others, being 20 cm wide at the largest point and rising up to 6 cm above the work surface (it’s not actually 6 cm thick, but the base is uneven). I like the idea of exploiting the trompe l’oeil effect. Could a lace appearance be created? It might be difficult to control penetration by the plaster into an actual lacy (with holes) fabric, but perhaps there are embossed materials that would work, or the lace could be adhered to a backing fabric. 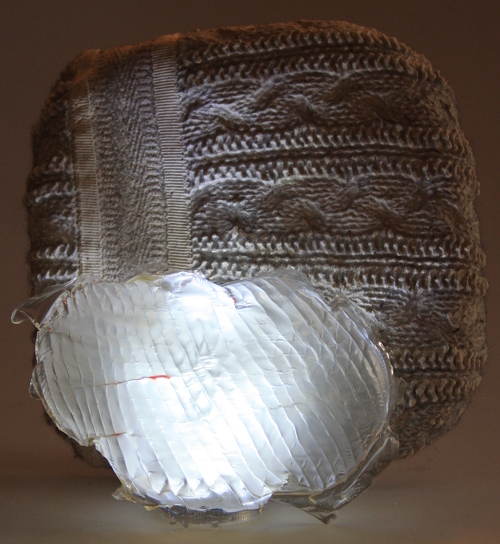 Knitted fabrics with runs from dropped stitches could be amusing too – fragility in plaster. This is the result of poor workmanship, not the sample intended. At the beginning of the work session I had prepared for four samples. Unfamiliar with weights of plaster powder for volumes of casts my initial batch mixed was only enough for the first sample (p3-47). I doubled the amount of powder but reduced volume of water in the second batch, which turned out only enough for the second sample (p3-48). I tried to repeat for a third batch, but I couldn’t get a smooth paste. I kept mixing and it only got lumpier. Suddenly it was setting in the mixing bowl. Perhaps I could still use it to cast the grip of my hands (thinking of Alwar Balasubramaniam’s Nothing from my hands, see 13-June-2014). No, it was as if the plaster had curdled. It was crumbling in my hands. * I was mixing too long. The supplier’s website faq warns that overmixing will cause the plaster to setup more quickly, often before you can pour it into molds. At this point I took a break and did some clean up. My original plan was to play with the visual difficulty with determining if shadow lines are from an indentation or a mound. 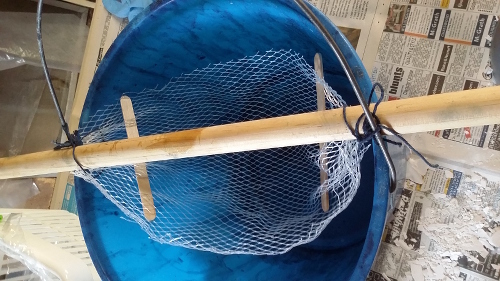 I was going to use a bed of kinetic sand and make some indentations using a very nice sisal rope, then cover with thin plastic and pour in plaster. Basically an extension of the texturing of p3-40 and the visual challenge in the photo of p3-38. While making preparations I decided this was too close a repetition, and partial embedding of the rope might be more interesting. I like the combination of materials very much. There seems to be a natural simplicity in them both which creates a link, while the textures contrast. The areas where the clean rope peeps through small windows in the plaster is most effective as the natures of the two materials are clearly evident. The areas of plaster which are textured by rope just beneath the surface I find less interesting. This was planned as the final cast sample and I just threw ideas at it. * create a cast with a void. I had no idea if this combination could work, which seemed a good reason to try. Can you identify the vessel? In the photos above the cast is supported in the front plate of an old speaker. 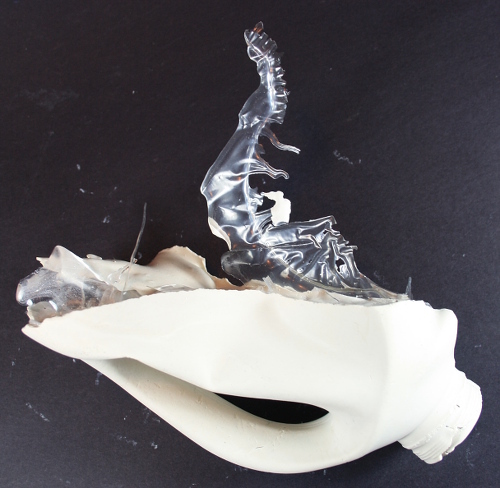 The vessel was a cut-down plastic 2 litre orange juice container. It was tied with light rope and supported mouth down in a tub. Shards of resin were placed inside, then plaster added. The next morning I faced the puzzle of de-molding a cast with a void. It took an stubborn hour, but I was able to snip the plastic away in small pieces, spiraling down the handle. I think this sample is very strong. The shape is complex with a series of flowing lines. There are areas of smooth, simple, solid plaster, then glints of light from the shards of resin. The main protruding shard brings movement and a focal point. There is something new, something of interest, at every angle. The knob formed by the neck of the container was an unexpected bonus. I thought the cast would have no natural base, which would be interesting in itself. Instead the knob acts as a stable anchor to position the cast, and I think the sample is stronger through having that simplification of shape and distance from the original purpose of the vessel. There was a little plaster left in the mixing bowl, so on the spur of the moment I attempted an idea that had been cut earlier. This links back to assignment 1 and the crumpling of paper. 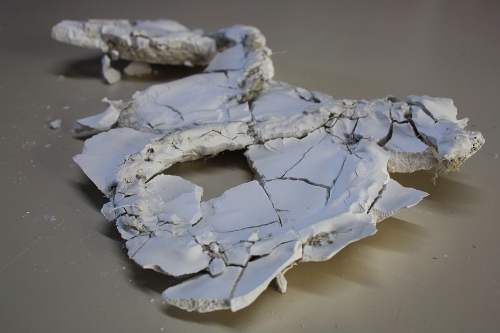 Could crumpled paper be captured, strengthened, made permanent, with the use of plaster? Unfortunately this sample doesn’t answer that question. By the time I scurried around, found and crumpled some paper, the plaster was well into setting. The result is unstable and flaky. However I think it is quite photogenic. It looks good, but is effectively unpresentable. Even if exhibited in a glass dome vibrations from passersby would dislodge more fragments. Encouraged by my earlier “failed” results, I decided to focus on casting with resin. I was interested in creating texture as well as volume by varying my molds. I was also interested in the thin sheets of dribbled resin in parts of sample p3-33. The cloudiness of the thicker areas hasn’t cleared – my working theory is that the centre hasn’t cured completely, as the product is intended for laminating not casting. 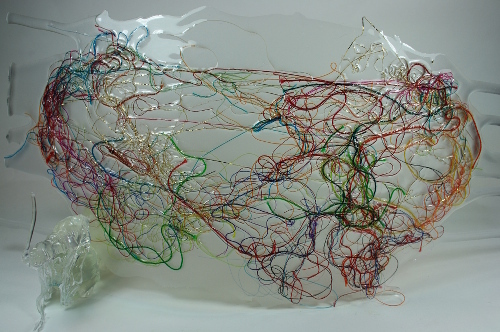 Could I complete the embedding part of the project working thinly and in dribbles to make the most of my material? Wanting to avoid sharp corners, so distinct in samples p3-35 and 36, I bundled up a sheet of large bubble wrap and hung it to create a round bottom (later to become the domed top). 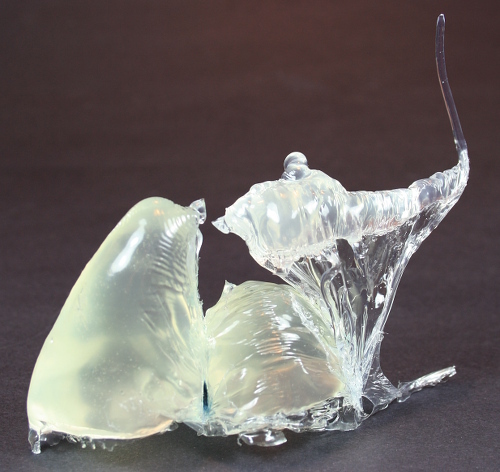 I didn’t use any kind of release, and a lot of the inner plastic is still attached to the final cast. This combines with the internal cloudiness to create a dull surface. It is difficult in the photograph above to determine if the circles are indented or protrude. In a second photograph I included samples p3-17 to 20 (1-September-2015) to bring some colour and light. I was also hoping for a clearer indication of the form of the cast, but it’s not effective. 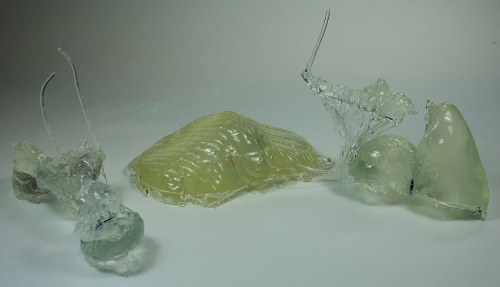 Using a release agent such as vaseline may have provided a better result, with plastic only caught in crevices. The shape overall is complex and intriguing. It fits comfortably in the palm of the hand, and calls out to be explored by touch and eye. The texture varies, smooth where formed around the dome of the bubbles, rippled in places where the bubbles had popped. 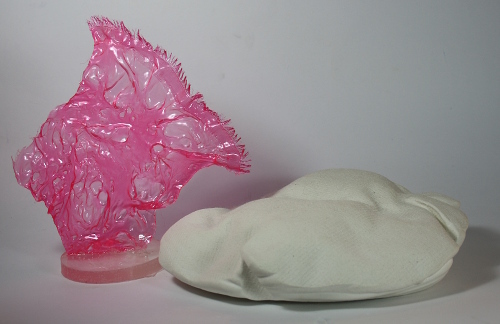 This was a particularly large scale of bubble, around 4 cm across, and combined with the general deformation of the cast the mold used isn’t immediately obvious to the viewer. There are clusters of fine bubbles in the resin. While often seen as a flaw I find this breaks up the bulk and adds an extra level of detail and interest. I thought it might be interesting to combine my two casting materials. This sample is shards of plaster embedded in resin. The result is plain and boring. The simple shape, some old packaging, is bland. The shards of plaster are packed quite thickly and the result is an undifferentiated mass. A few corners of plaster break the surface and are quite hard. This suggests a possible treatment to strengthen and protect plaster. It could be interesting to pour resin over part of a plaster cast. The photograph bringing the two casts together is effective. P3-39 is smaller – around 10.5 cm long compared to p3-35 at 16 cm – but the difference is reduced by their relative placement. Shapes are similar but different, and the shared material element also helps to create a conversation between the two pieces. Finally in this orientation, curved edge down, the irregular protrusions of p3-39 can be appreciated. 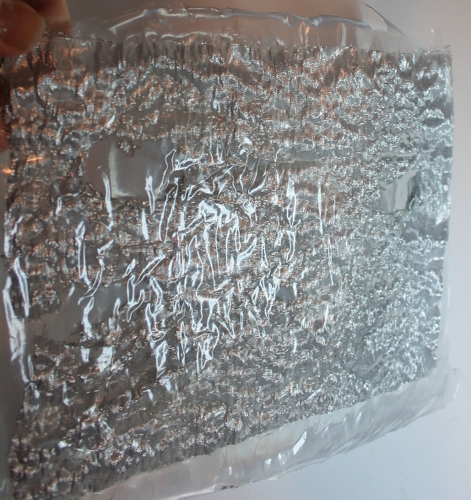 Sample p1-74, silver lamé distressed using a heat gun (21-April-2015), is here embedded in a sheet of resin. Of the original sample I noted that although the texture was exciting its crunchy and fragile nature would make use very difficult. While Sorting for assignment 1 (23-May-2015) I thought of stabilising it by fusing to organza, or perhaps fuse between layers of plastic. To make the current sample I prepared a bed of kinetic sand with texture lines from a thick dowel. 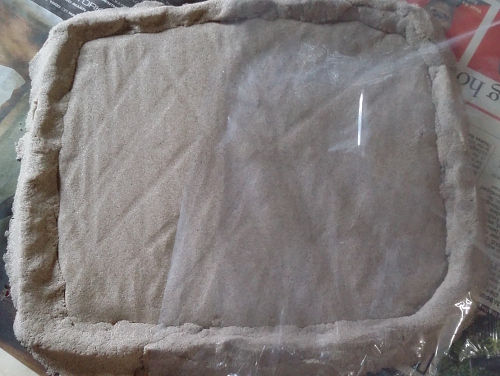 Two layers of thin plastic protected the sand. 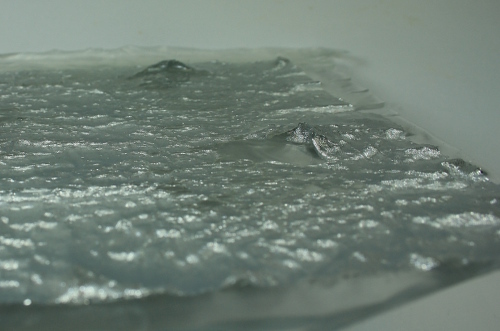 The silver lamé was placed on the plastic, then resin poured on. I chose to cover all the fabric with resin, but allowed some distorted areas to remain above the general surface level. The resulting sheet is thick and quite inflexible. I would need to experiment with drilling if I wanted to stitch through it. The distressed, distorted surface of the lamé is clearly visible, but no longer fragile. The surface textures were difficult to photograph, but the textured sand left a pleasant, unobtrusive, general rippling of the surface. On the other side where parts of the fabric sit above the surface, the fabric is crisp and strong and from the right angle adds an extra level of interest. The real potential here appears to be the broken visibility created. I played with a number of patterned fabrics. Larger patterns tend to become unreadable, but smaller patterns are concealed/revealed effectively. The standout combination was the top photograph, backlit and transforming an unsatisfactory sketch. In the right context this technique could be a very useful way of stabilising a fragile surface, and of creating a continuous surface with variable transparency. 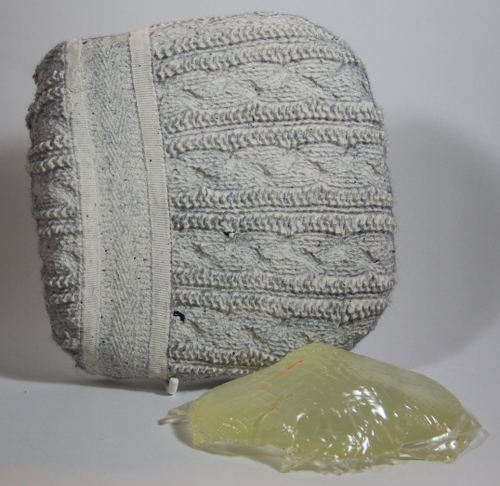 This sample began with the idea of netting of a hammock creating texture in a mold. 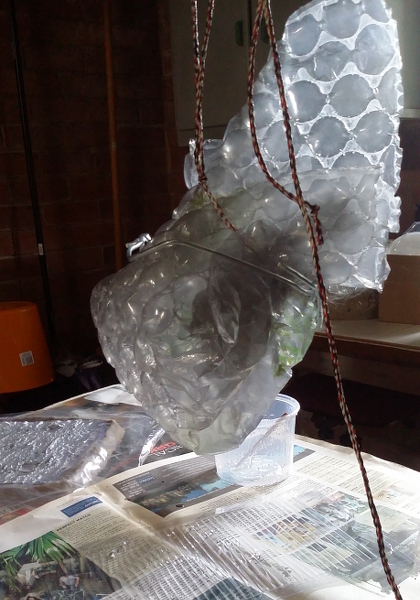 The photograph on the right shows the base setup – a mesh fruit bag was suspended over a bucket. The “structural” pop sticks act to spread out the ends. 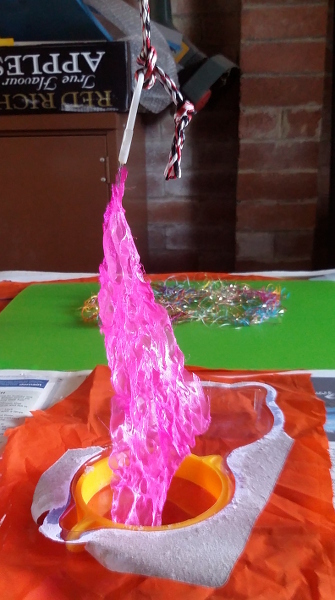 This structure was lined with orange plastic (off-cuts from the extended sample of assignment 1, 2-July-2015). The result is similar is size and general shape to sample p3-38 above, but where that was very complex this sample is deceptively simple. There is a gentle undulating irregularity in the overall shape, textured by a series of fine, parallel lines. The cross lines of the grid are almost imperceptible, except in two places where the orange plastic liner has caught in the crease. Tumsae, seen recently in Wollongong (21-September-2015). Photographed with earlier resin samples, an orange cast can be seen in the colour of the new piece. Possibly this has been transferred from the plastic – another property to explore? 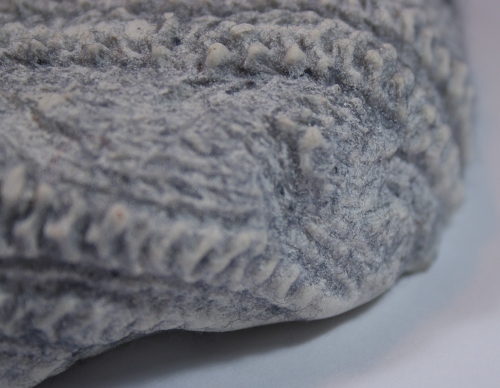 Inspired by Meiri Ishida’s work, also seen in Wollongong, this sample was an attempt to harden synthetic felt without changing its visual appearance. The result is a flexible board that can, with some difficulty, be cut with scissors. I brushed the resin on, which roughened the surface, I also used too much, so there is a shiny plastic finish on part of the bottom surface. The felt used by Meiri Ishida was thicker. A lot of experimentation would be needed to get just the right balance of materials and to fine tune the application process. Having a small amount of resin left over from other samples, I quickly picked some tiny flowers and fronds and set them in resin. The flowers are only partly covered. It will be interesting to see any changes in the materials over time. Sample p3-44 is the most direct application of the dribbling question posed at the beginning of this post. The base material is a small net I knotted in a cotton warp yarn some time ago. I suspended the net over a plastic basket lined in thin plastic. Resin was rubbed on by (gloved) hand, three times with five minute breaks in between. 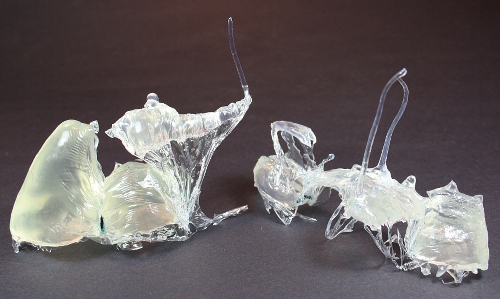 I was hoping to create stalactites, as seen in samples p3-33 and 34. These didn’t form. Possibly I should have waited until the resin was less runny, possibly I should have a much shorter gap between suspended net and the base. No stalactites formed, but little “dew drops” of resin sparkle along the net like spider webs on a misty morning. 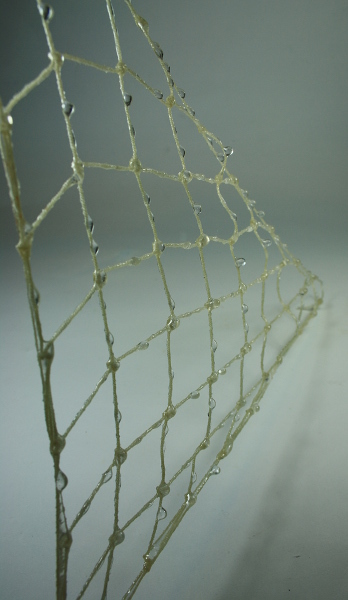 The net is stiff and holds its shape, but there is some bend flexibility. I haven’t pushed it to failure point. Difficult to photograph, the effect is charming. It could make a sparkling statement if well-lit, and if hung could swing freely for extra interest. It could be interesting to do this treatment on net placed over a mould or suspended in a more complex arrangement. Drips from the process gathered in a pool below, and I was able to separate most of it from the liner plastic in one piece. In the photograph the drip pool is shown with the lightfold I made in a recent workshop (19-September-2015), and if you click on the photo to make it larger you may be able to see the visual distortion caused by upstanding dribble lines. * move into 3D – curve the sheet. I used a thin plastic chopping board sheet – flexible but not floppy. A mix of cut threads was placed on the board (this can be seen in the background preparation photo of the next sample). Resin was gently dribbled over. There was no barrier – spread was controlled by volume of liquid resin. After perhaps 20 minutes I tied the board over a large pvc pipe to form the curve. The resin wasn’t as set as I hoped and there was slow dribbling down the sides. After curing overnight the resin could be removed from the plastic base. When first removed the curve was sufficient to stand the sheet upright with no other support, but it isn’t stable over time. The underside, which was against the plastic board, is satin smooth with a frosted appearance from the very slight texture of the plastic. The upper side is glossy and rough with the texture of the threads. Most of the thread is darkened and glossy as if damp, but there are some sections untouched by resin and still soft and with some movement. I wasn’t able to piece it with an awl – another reminder to attempt drilling. This sample is very pretty. 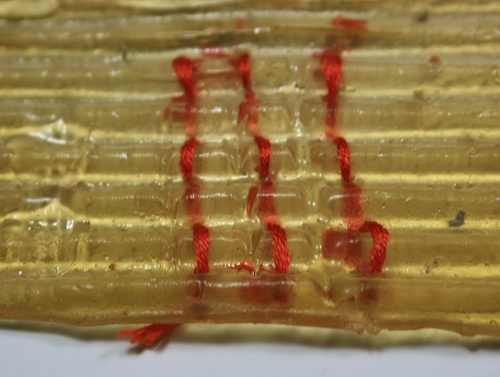 The resin is thin and the threads seem to sit on the surface. It is particularly effective backlit (from either direction) or backed by a light coloured surface. I see a lot of potential in this technique. It is very decorative, highly textured and responds well to lighting. The idea for this sample came when I noticed a mixing stick left in the resin pot which had developed a little “foot”. Could I create an upright, self-supporting piece of resin covered fabric? The fabric started as sample p1-75 (21-April-2015), heatgun treated crystal organza. At the time I noted variation in colour and transparency which could be useful. It appeared again as part of sample p2-28 (27-June-2015) in a hinge join experiment. For the current experiment the fabric was suspended above the worktable. 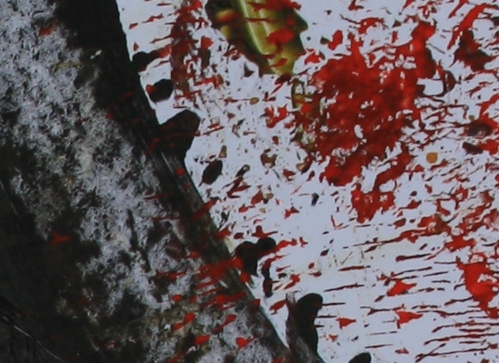 A silk painting claw in one corner of fabric minimised the attachment point. The lower corner fell into a ring mold on the table. Resin was gently dribbled onto the fabric. I ensured that all the fabric was covered, and any excess resin was held in the ring mold to form a base. Resin was applied three times with five minute breaks between. I am thrilled by the result. The fabric is beautifully displayed. It is quite upright, firm and stable on its base. All the texture and variable transparency of the fabric has been retained. In the less dense areas warp and weft can still be distinguished by touch as well as sight. Although it is still, the sample looks dynamic. I particularly like the selvedge along one side, making the nature of the object quite clear. This is very exciting. It provides an easy, stable way to create height with no external support required. There must be limitations in size (the sample is 17 cm high), weight of fabric and stability. I’ve been playing with lighting on both sides, with other samples, it always looks good. I’ve been spending a lot of time arranging and rearranging my growing set of casting and molding samples. In the arrangement above three of my stars, samples p3-45, p3-46 and p3-33 work together to create a moment of delayed gratification – “this looks interesting… what’s that behind it?” I like the idea of not being obvious from every direction in an exhibition space. More elements together. It’s not quite working, but I like the various heights achieved. A low bookcase at one end of my worktable provides some space where I collect samples while working through an assignment. Often as I walk past I pause, move something slightly, try a new combination. I think there’s some real promise in this set.